CHARGER = US$ 1500 suggested retail...now $799 (Standard and Comfort models), plus shipping and out-of-carton assembly. CHARGER = 20 MPH top assist speed and easily modified for higher speed..
CHARGER = 12 Ahr. SLA battery pack with more than twice the range of the MB... Battery also pops off for easy charging in 4 hr., or an 80% charge in 1 hour using built-in charger! 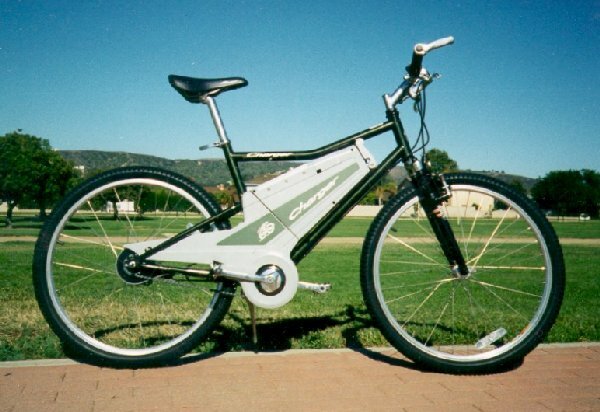 NOTE: extended range 15Ah lead acid battery option, or new super light weight 12Ah lithium iron phosphate battery option now available for these USA bikes! 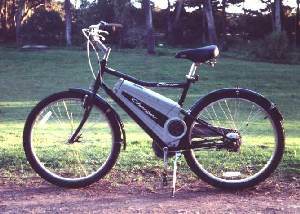 MB = From 0-20 km/h (0-12.5 mph), the electric motor contributes 50% of the energy, and you contribute the other 50%. From 20-24 km/h (12.5-15 mph), the amount of electric assist slopes down, and from 24 km/h up, the bike is propelled by you. CHARGER = From 0 to 20 mph the electric motor contributes 0, 50, 100, 200, and 300% of your energy (your choice), and does not slope down unless the motor reaches it's ~1/2 HP output (36 Amps peak power). 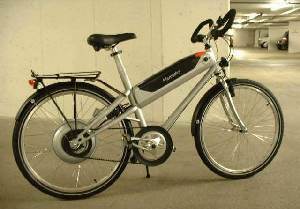 MB = Sanyo hub motor with 3 speed gearbox (The Sanyo motor is rated at 300 Watts, but is limited to 220W of power-assist to conform with EU regulations. This motor and gear box is not normally serviced by bike shops). CHARGER = Mid mounted 375W Revco motor attached to a 7 speed internal gearbox which may be rebuilt by most bike shops in the unlikely event of failure. No motor failures on CHARGERS that we know of to date (even for those with 13K miles and going strong). MB = difficult to mount on standard car bike racks. CHARGER = pop the pack off and it fits on a standard rear yoke bike rack. MB = parts are non-standard for the most part...difficult to find other than through manufacturer. CHARGER = standard bike and battery parts for the most part, other than the motor controller which can be replaced by common DC motor controllers. Distributor offers a kit to turn the bike into on-demand throttle type system, as an option to replacing original electronics. It appears the Germans may know how to make great cars, but Americans have good machines too...including best e-bikes ever made in our view.